For the past few years, I’ve been saying that I need to read more classics. Not because have any sense of obligation or am plagued by feelings that I should be reading anything in particular or that there are books that are more worthy than others but because when I do invest the time in the stories and writing that have really stood the test of time, I really do enjoy it. I did a couple of read-alongs this week and the responses that I’ve had from people on Twitter and the discussions that I’ve had on the blog have been some of the most interesting. I’m not saying that that’s only down to the fact that I’ve been reading classics but I do feel as though there’s something about reading books that have been read by countless others that’s kind of nice. 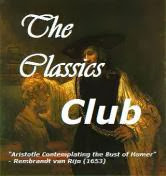 I’ve umm-ed and ahh-ed over whether to sign up to the Classics Club ever since I first saw other bloggers signing up. 50 books over 5 years might not sound like a lot to those that read 100+ books a year but I tend to read 50-65 books in a year, which would make almost a fifth of the books that I was to read each year classics. And yes, I do know that that is rather over-thinking things SO this year, buouyed up by actually reading Charles Dickes in 2013 and not dying in the process, I decided to stop thinking about the numbers and just start reading some classics and see how I get on. Plus, putting together the list was fun in and of itself so even if I never actually read any of these books, that’s something. Since I’ve been putting the list together over the past week or so, I’m going to call my start date 1st January 2014, making my target for reading and reviewing all 50 of these beauties 31st December 2019. That’s ages. I can definitely do this. Any favourites I should stick at the top of my pile? Any stinkers I should be avoiding like the plague? Let me know! And if you fancy signing up yourself, head HERE!